San Francisco Christmas lights are one of my favorite things about the holidays. You will find colorful displays all around town including Union Squre, Fisherman's Wharf, and City Hall. You will also find a couple of tour recommendations that will take you past the top displays in just a couple of hours. Read on for my recommendations on the best places to stop and admire the lights during your stay this holiday season. 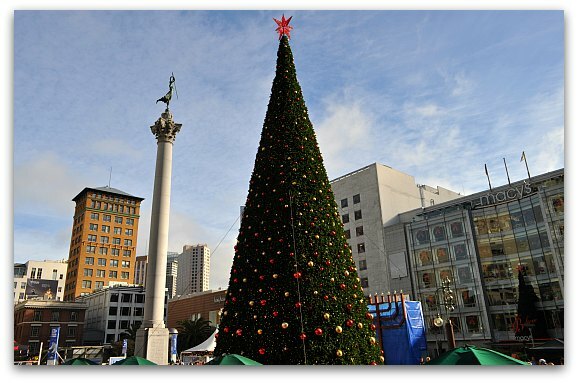 Sparkling Union Square acts as the centerpiece to SF's downtown commercial district, especially during the holidays. Not only will they have a huge Christmas tree lit up with over 33,000 twinkling lights and 1,100 ornaments, there will also be an ice skating rink and plenty of Christmas decorations in all the store windows surrounding it. This is a festive part of town to walk around and do some holiday shopping. The tree lighting is always the Friday after Thanksgiving and the tree is usually lit until the end of the year. 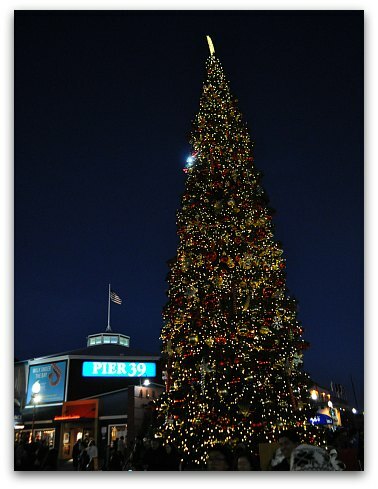 One great place to find San Francisco Christmas lights is at Pier 39, where the magnificent 60-foot-tall Christmas tree will be glistening every night during the holiday season. Pier 39 is one of San Francisco's the premier tourist destinations for its variety of restaurants, shops, family activities, and proximity to the waterfront and ferries. This is a great place to hang out and soak in the holiday cheer. The first lighting is on November 21 - January 1. 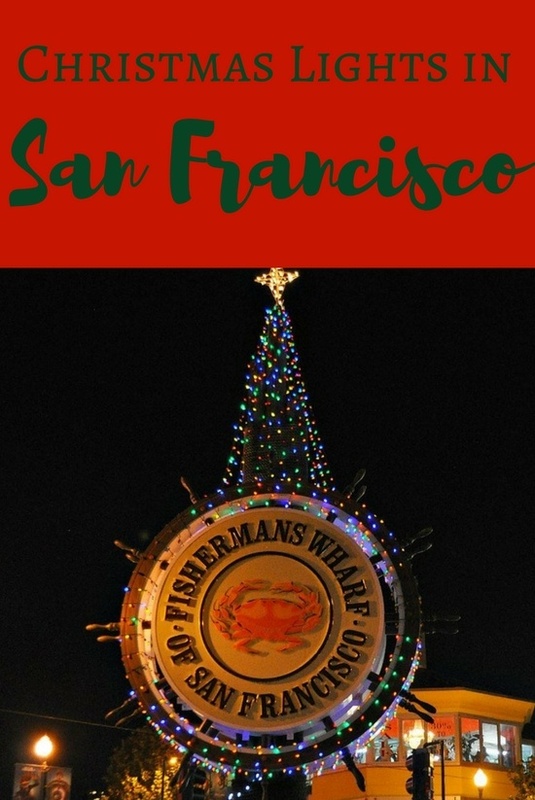 The perfect place to take a holiday photo with San Francisco Christmas lights is at the Fisherman's Wharf Sign, which will be decked out for the season. 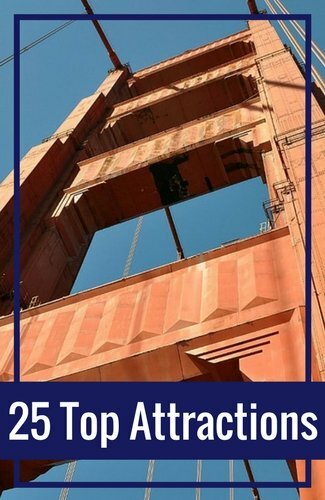 It's a lovely postcard image to show friends and family that you enjoyed your holiday vacation in SF and visited the top attractions. A truly memorable way to see the Christmas lights is on a 90-minute city tour aboard a vintage red fire engine! 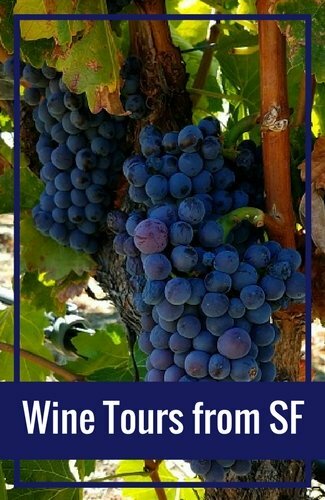 Beginning at Fisherman's Wharf, you and a small group of up to 12 other passengers will get a guided tour through the glowing Presidio, Union Square, Embarcadero, and Market Street. 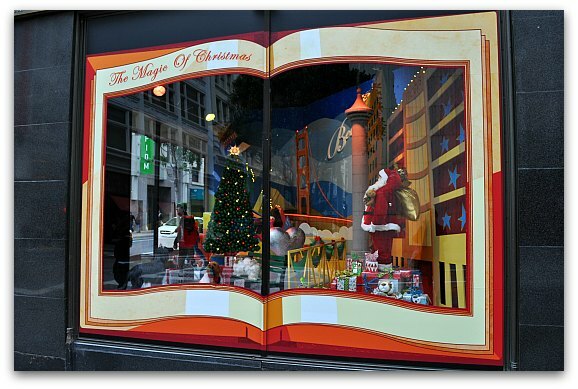 Macy's, the biggest department store in San Francisco's Union Square, has made it a holiday tradition to decorate their store windows with elaborate displays that bring joy to all passersby on Stockton and O'Farrell Streets. Throughout the three decades in which they have paired up with the SF SPCA to include adorable cats and dogs in these displays, they have helped more than 8,500 animals get adopted. This wonderful display of goodwill has become a symbol of the holiday spirit in San Francisco. Market Street is the spine that runs through downtown San Francisco, always full of cable cars, shops, cafes, and people bustling to and from work. With so much action, it only makes sense that during the holidays, this street take on an especially bright, cheerful look. Starting in mid-November, lights and snowflakes will be illuminating this thoroughfare. 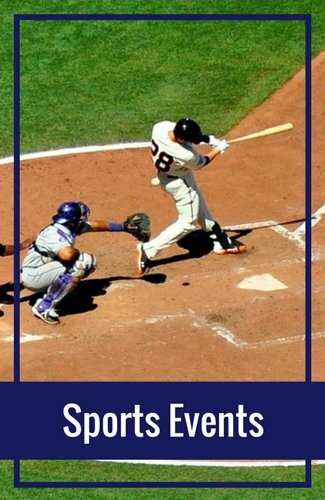 Check it out on your way to Union Square or the Embarcadero. A fun way to see more San Francisco Christmas lights is by heading to the SF Zoo. A delightful change from the urban decorations, these lights transform the zoo into a colorful winter wonderland, complete with reindeer, Santa Claus, and a holiday marketplace with delicious treats. 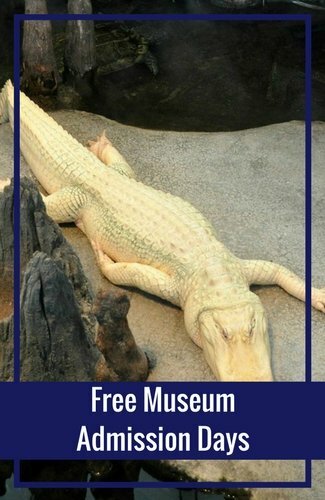 Take the whole family to this attraction, which runs from mid-December until the end of the year. The Fairmont, one of SF's grandest hotels, has a long tradition of creating elegant Christmas displays designed to enchant its guests and the public. The highlight every year is the completely edible two-story gingerbread house in the lobby. Head over to the Nob Hill neighborhood to admire the details and aroma of this extremely sweet holiday treat. 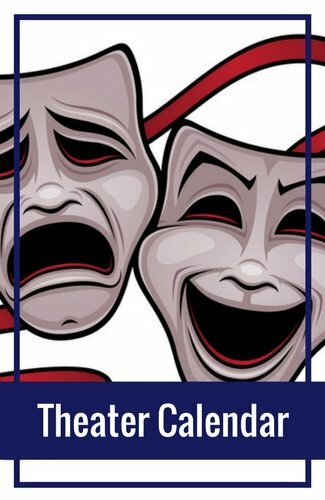 This fun event opens on Thanksgiving Weekend and runs until the first of the year. 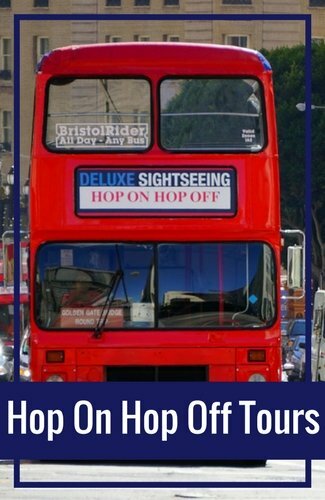 This is by no means your average bus tour. Not only will you get to see San Francisco's favorite sights like Lombard Street, Chinatown, the Palace of Fine Arts, and Union Square specially lit in holiday cheer, you'll get to see it all from a stylish 70s-themed VW van! Your small group will get Santa hats and a personalized two-hour guided tour through these scenic neighborhoods. To kick off a month of festivities on Union Street in SF's historic Cow Hollow neighborhood, the annual Fantasy of Lights event will take place on December 1, 2018. The candy cane meters and lights on the Victorian homes will have this district glowing all season long, and will set a magical backdrop for this San Francisco Christmas lights festival, which includes a visit from Santa, horse drawn carriage rides, ornament decorating, and more fun activities for the whole family. On Friday, December 14, 2018 from 6 to 8pm, you can watch a parade of boats lit up with holiday decorations cruise along the SF waterfront. The route starts from Pier 39, heads west past Fisherman's Wharf, Fort Mason, and the St. Francis Yacht Club, and turns around off of Crissy Field. After the parade, the Fisherman's Wharf Fishing Fleet will stay illuminated throughout the holiday season, and you can view the beautiful vessels from Jefferson Street between Jones and Taylor. The Parol Lantern Festival is a Filipino-American holiday tradition that showcases some of the most unique and festive San Francisco Christmas lights. The 16th annual event will take place on Saturday, December 8, 2018 from 5 to 9pm. Leading up to that day, the Bayanihan Community Center will be offering workshops teaching the public to make the colorful, star-shaped lanterns, which will then be displayed at Yerba Buena Lane. These lanterns are an important symbol of peace, hope, luck, and light. 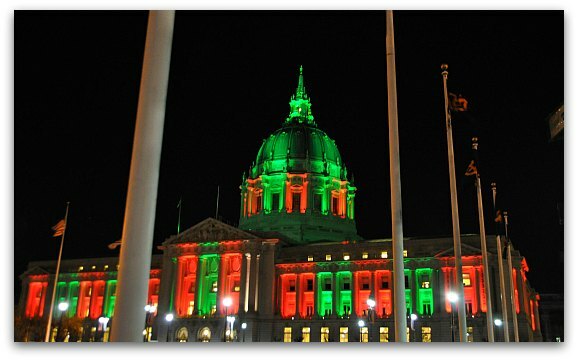 Every year, SF City Hall gets into the Christmas spirit by glowing red and green throughout the holiday season. Normally shining white with its beautiful golden dome, the alternating colors on its columns really make this architectural gem a treat to look at on cold winter nights. The best place to snap your photos is from the Civic Center Plaza on the eastern side. 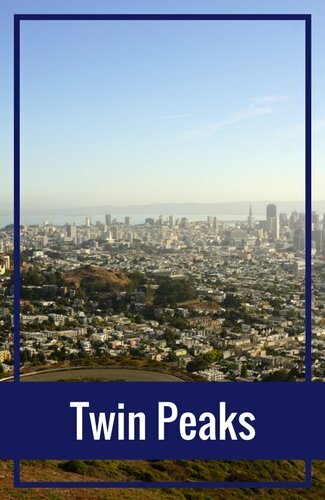 You can easily get here by taking BART or Muni light rail to the Civic Center Station and walking two blocks west. For the first time this year, you will also find an entire Winter Wonderland near City Hall. It will include outdoor ice skating, a skating track, and lights on the plaza's line of trees. Beginning December 3, 2018 with the annual tree lighting ceremony, you can stop by anytime to see the dazzling Tree of Hope on display in Grace Cathedral. At 22 feet tall, it is the largest origami-decorated Christmas tree in the world. It's covered in over 15,000 handmade paper cranes and stars that each contain hopeful messages for the future contributed by people of all nationalities. Simply walk inside to visit. Every year since the 1980s, this adorable Victorian home and the 65-foot pine outside of it are transformed into a larger-than-life outdoor Christmas living room, with giant stockings and teddy bears hanging from the fireplace-garage, and enormous colorful presents surrounding the gigantic tree. This local favorite of the Castro neighborhood is worth a visit and a photo op. You can stop by 3650 21st Street any day during the month of December, and on some nights, you may even enjoy a visit from Santa. Every year, all around San Francisco and the Bay Area, you can be part of the holiday season kickoff by attending tree lighting ceremonies in public squares, parks, shopping centers, and more. Many of these events feature live entertainment, refreshments, family activities, or a visit from Santa in addition to the fabulous decorations. Beyond Christmas trees, there are also menorahs, giant gingerbread houses, snowflakes, and more on display. Click the link below to find dates and times to enjoy these ceremonies and San Francisco Christmas lights displays. Make your Christmas in the City by the Bay a special one! In addition to viewing the San Francisco Christmas lights, you'll find lots of special holiday events going on, including Christmas Eve performances of The Nutcracker ballet, musicals, bay cruises, and more. On Christmas day, some attractions will be closed, but many of them you can still visit! Find out which sights will be open, ticketing information for shows, restaurant recommendations, and more for these special days. 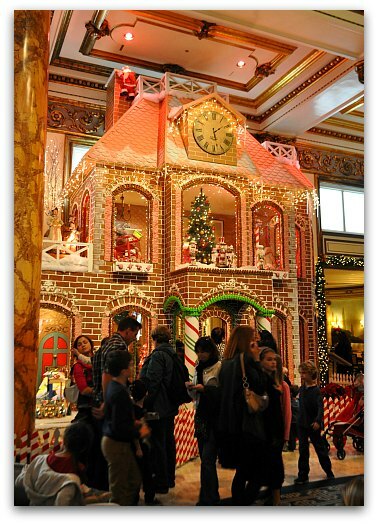 Santa Claus is a busy man, but he manages to make his rounds to the major malls, Christmas displays, and family attractions in San Francisco. He'll make several appearances this season. Click on the link below to find out exact locations, dates, and times, so you can plan your kids' visit with the jolly man in the red suit. Get your wish lists and cameras ready! Apart from the many San Francisco Christmas lights, one of the most popular attractions of the holiday season are the December performances of The Nutcracker by the SF Ballet. This company was the first to bring this Russian holiday classic to the US. The timeless Tchaikovsky score, colorful costumes, and enchanting scenes are a wonderful treat for the whole family.